Dry season in the Venezuelan Llanos. We are about ten miles from the nearest paved road bouncing northwards between Cano Santo Domingo and the Rio Tinaco looking for a place where we can access the river. Despite the heat and the fact that we have been on the road since before dawn my companion on this trip, Norbert, and I speak excitedly about things to come. We never actually decided on a language and we move between Spanish, German, and English in our conversations. When you want to express a word that you do not know in the language being used, you just change to a language in which you know the word. We try to drive up to a ranch that borders the river and ask if we can trespass. Zebu cattle wander in front of us and refuse to move. These cattle live with Jaguar, Anaconda, and Piranha. A beeping horn does not even rate a bored nod from them. Eventually we make it to the cinderblock ranch house where a few llanero men lay about, swinging in hammocks. A naked three-year-old kid chases some sort of large strange looking bird with a stick while several iguanas lounge in the shade. We are told that we need permission from a boss who will be along shortly, "ya viene." Do not let the translation fool you. "He is coming" just means that it will most likely be sometime today. Amazingly the boss, accompanied by his shotgun-toting bodyguard, arrives in about an hour. After some small talk, he decides that we can use the river. He sends a ranch hand to guide us and we bounce cross-country for about two miles with the ranch hand standing on the back bumper. When we reach the river, the ranch hand jumps from the truck, points to the river, and without another word walks off into the llanos in the direction of the ranch. I grab my four-foot seine and wade in waist deep. On the first pull amongst some driftwood I bring up a one inch P. maccus and can hardly believe my eyes. Over the next hour we collect about a dozen P. maccus and let out shouts of joy every time we find yet another. Despite net after net full of interesting loricariids, we were both the most excited over this pretty little striped fish. All of the captured P. maccus transported well and six months later I still have every single one that we caught that day. They readily adapted to the aquarium and were eating cucumber after two days. Although a number of small, striped Panaque are sold in the aquarium trade, P. maccus seems to be one of the most common. Most people know this fish as LDA 22, but the photo in Aqualog (pg 83) is not the best for identification since it depicts a very young specimen. The color pattern in the photo changes once the fish reaches about two inches. Even the pattern on the dorsal fin changes with age. Fry have three dark bars while juveniles and adults have two. The fish pictured above match very well with the holotype's color pattern, but there are also specimens with a broken or wavy pattern. The fish pictured as L 162 (from Venezuela not Brazil) looks like a very mature female P. maccus with a slightly wavy pattern while L 104 appears to also be P. maccus with a very wild stripe pattern. The wavy pattern form is found in the actual Orinoco and its tributaries in Bolivar State, Venezuela, while the "normal" patterned P. maccus comes from further north and west (Cojedes, Portuguesa, Guarico, and Apure States) in the llanos where the drainages run into the Rio Apure. I believe that the two forms represent geographical variation, but further research could show them to be two distinct species. Adding to the confusion is the fact that the color pattern changes with age. Young are a dark brown with five distinct white stripes. Full-grown adults are a much lighter brown and possess from seven to eight cream-colored stripes. L129, for example, is a Venezuelan fish but has a black basic colouration with very light gray wavy stripes which, again, fade and break up with maturity. There also appears to be a few Panaque from other drainages that are either regional variations or distinct species. Some authors even believe that the Peruvian L204 is P. maccus. If this is true, P. maccus has a distribution that covers not only the Orinoco system, but also the Amazon basin. It will certainly be some time before we completely understand the inter-relations of the dwarf Panaque species. If you come across any form, buy them all and set them up in their own special tank. Not only are they interesting to keep, but they are not too difficult to spawn. Given the amazing color pattern of the juveniles, P. maccus should be a big hit at the local fish club auction. 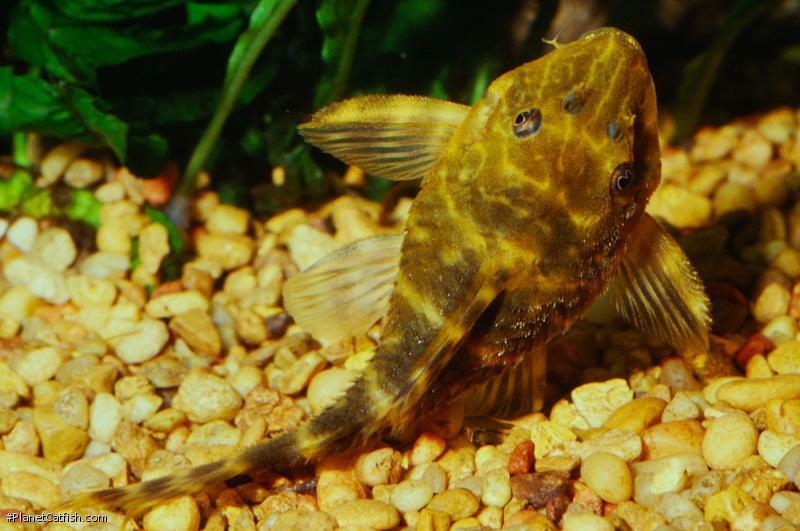 If you have spawned Ancistrus, Rineloricaria, and Farlowella this fish (or another dwarf Panaque) should be your next challenge. 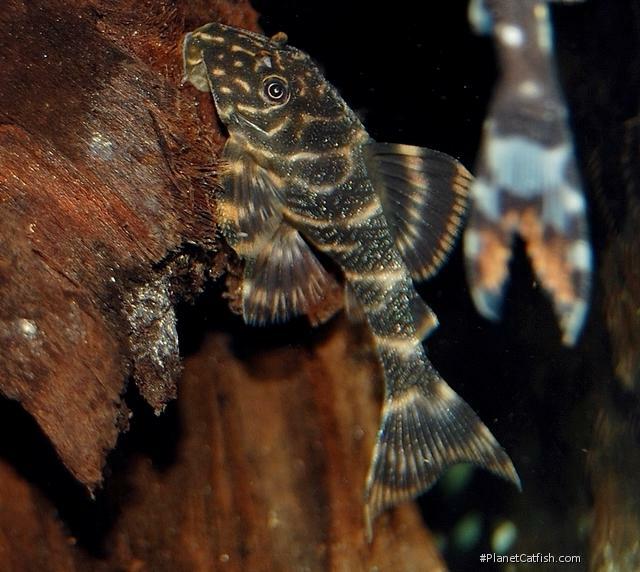 Oh yeah, Panaque is a Venezuelan for "pleco" and it is pronounced "Pa-nah-KAY." The above text and the data below was supplied by Shane, I have very little to add except that you might encounter this species as listed as Peckoltia vittata in various older hobbyist books. More recent hobbyist books (such as Bailey and Sandfords New Guide to Aquarium Fish) will list the species as P. maccus. You can find pictures of the real P. vittatus in the Cat-eLog. Type Locality Río Las Marinas, trib. of Río Portuguesa, Río Orinoco basin, ca. 9°05'N, 69°40'W, Estado Portuguesa, Venezuela. Etymology Panaqolus: Inelegantly derived from the indigenous term Panaque and in a form that infers a smaller size than that genus. From the Latin maccus, for clown or buffoon, in reference to the common name "clown plecostomus" widely used by aquarists for this species. Identification A detailed account can be found in the Catfish of the Month article (link below). The species is sometimes confused with L448 (LDA068), which is very similar, but grows larger. The main key for distinguishing them is that juvenile L448 have stripes/squiggles/scribes on the head, which only appear in mature Panaque maccus. The mature size of L448 can be over 100mm, something not seen in P. maccus. Distribution P. maccus is found in Andean whitewater rivers flowing through the Llanos into Rio Orinoco. Rio Apure drainages and reported from Rio Caroni. Other Parameters The aquarium water should be clear in colour with neutral values. Measurements taken at the Rio Tinaco in the dry season were temperature 80°F, pH 7.5, and fairly hard at 3,000 mu. In the wet season the water is cooler, softer and has a neutral pH due to the heavy rains. Feeding A wood-eating fish, the tank should be decorated with several different types of driftwood. These fish really like to have something to chew on. Squash, cucumber, and other vegetables should be readily available to them (yams are a favourite). Supplement two to three times weekly with frozen foods. Furniture The Biotope: P. maccus are only found amongst driftwood tangles close to the banks in the main river channels. Their striped brown and cream coloured body provides excellent camouflage in this environment. Place various types and lengths of driftwood at slanting angles from the back of the tank to the front. The back and sides of the tank should be covered with a dark background. Use sand or fine gravel that is a red-brown in colour for the substrate. Hide the spawning caves along the back of the tank behind the driftwood. Compatibility A peaceful fish well suited to the community tank provided it has driftwood. The tank must have good mechanical filtration as these fish produce lots of waste from their steady diet of wood. Suggested Tankmates Other loricariids, small cichlids and tetras. In a small tank (15-20 gallons) add a school of small tetras. Silver hatchet tetras were common in the Rio Tinaco. A larger tank can house a community of wood eating loricariids. Other loricariids caught side by side with P. maccus included: Hypostomus plecostomus, Hypostomus emarginatus (L 153), Hypostomus plecostomoides (L166), L092, Hypoptopoma, Otocinclus, Lamontichthys llanero, and Glyptopterichthys (L154). A tank with this many wood-eating loricariids requires heavy filtration and frequent large water changes. Breeding The fish should be maintained for two months under dry season conditions (see above) with thrice weekly feedings of frozen foods. In preparation for breeding, add a power head and air stone to the tank, unplug the heater, and begin making 20 percent daily water changes with cool rain or reverse osmosis water. The temperature should be allowed to fall to 70-72F. After four water changes, plug the heater back in and wait for the spawn. If, after one month, the fish have not spawned start the process over again. It may take a few cycles to get the fish spawning. Provide various sized spawning caves made from PVC or slate. The caves should be just large enough to allow the female (which is larger) to squeeze in and five to six inches in length. See also this breeding article in Shane's World. There are 496 registered keepers, view all "my cats" data.